No safari is complete without a photograph of the majestic splendour of an African elephant. We can guarantee that seeing one of these enormous beasts in their natural environment will be one of the best things you will ever see. These huge animals are so intelligent that they can recognize themselves in a mirror and are known to grieve when one of the members of a herd passes away. Highly social and skilled, elephants love the water and a trip to most watering holes is a guaranteed opportunity to see them frolicking and splashing around. Hwange National Park is a nature lover’s dream destination. The park, which is the largest in Zimbabwe, has the highest density of African elephants in the world. Conservation efforts by the Zimbabwean government has ensured that these majestic mammals are kept safe from poachers. Hwange National Park also plays host to many other large mammals such as lion, leopard, spotted hyena and the Cape wild dog are also residents of this awe-inspiring reserve. Located in a malaria-free zone near Port Elizabeth, this park was created in 1931 to harbour the last remaining elephants in the area. Now there are over 600 elephants in the park, as well as the rest of the Big Five. 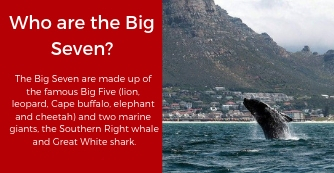 A recent expansion of the park now includes a marine reserve near the coast and is considered the only national park in South Africa to be home to the Big Seven. Chobe National Park, located in the northeastern corner of Botswana is famous for its large herds of roaming elephants. It is also one of Africa’s top wildlife destinations. In addition to the herds of elephants, Chobe National park is also home to at least 440 bird species and the rarely seen oribi antelope. Whether you choose to camp under the stars or go for a game drive, Chobe is a place that everyone can enjoy. Etosha National Park is home to some of the largest elephants in Africa due to the thick vegetation found in the park. For a keen photographer, this immensely popular park is a great place to visit due to the abundance of subjects that can form an amazing photo collection. You will also have an opportunity to see the black rhino, the lion and the leopard. Make your safari experience complete by including one (or all) of these fantastic parks into your itinerary. From scrubland to desert, elephants have conquered their environment and can now be enjoyed naturally from the safety of a guided safari. Just don’t forget to take pictures.